Einstein himself resisted all efforts to explore his psyche, rejecting, for example, a Freudian analyst's offer to put him on the couch. But curiosity about him continues, as evidenced by the unrelenting tide of Einstein books Amazon.com lists some 100 in print). The pudgy first child of a bourgeois Jewish couple from southern Germany, he was strongly influenced by his domineering, musically inclined mother, who encouraged his passion for the violin and such classical composers as Bach, Mozart and Schubert. In his preteens he had a brief, intense religious experience, going so far as to chide his assimilated family for eating pork. But this fervor burned itself out, replaced, after he began exploring introductory science texts and his "holy" little geometry book, by a lifelong suspicion of all authority. 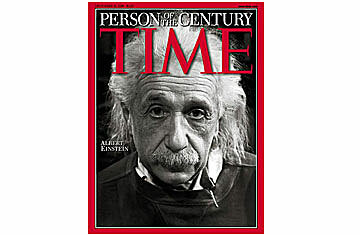 His easygoing engineer father, an unsuccessful entrepreneur in the emerging electrochemical industry, had less influence, though it was he who gave Einstein the celebrated toy compass that inspired his first "thought experiment": what, the five-year-old wondered, made the needle always point north? At age 15, Einstein staged his first great rebellion. Left behind in Munich when his family relocated to northern Italy after another of his father's business failures, he quit his prep school because of its militaristic bent, renounced his German citizenship and eventually entered the famed Zurich Polytechnic, Switzerland's M.I.T. There he fell in love with a classmate, a Serbian physics student named Mileva Maric. Afflicted with a limp and three years his senior, she was nonetheless a soul mate. He rhapsodized about physics and music with her, called her his Dolly and fathered her illegitimate child--a sickly girl who may have died in infancy or been given up for adoption. They married despite his mother's objections, but the union would not last. A handsome, irrepressible romantic in those years, he once had to apologize to the husband of an old flame after Mileva discovered Einstein's renewed correspondence with her. He later complained that Mileva's pathological jealousy was typical of women of such "uncommon ugliness." Perhaps remorseful about the lost child and distanced by his absorption with his work  his only real passion  and his growing fame, Mileva became increasingly unhappy. On the eve of World War I, she reluctantly accompanied Einstein to Berlin, the citadel of European physics, but found the atmosphere insufferable and soon returned to Zurich with their two sons. By 1919, after three years of long-distance wrangling, they divorced. He agreed to give her the money from the Nobel Prize he felt sure he would win. Still, they continued to have contact, mostly having to do with their sons. The elder, Hans Albert, would become a distinguished professor of hydraulics at the University of California, Berkeley (and, like his father, a passionate sailor). The younger, Eduard, gifted in music and literature, would die in a Swiss psychiatric hospital. Mileva helped support herself by tutoring in mathematics and physics. Despite speculation about her possible unacknowledged contributions to special relativity, she herself never made such claims. See Einstein's refrigerator on the Best Inventions list.